I'm in love with this picture. It just evokes everything that I wanted my vegetable garden to be. Back in 2004, the March garden issue of Martha Stewart had this amazing article called "Vegetables, Beautiful Vegetables," and it featured the gardens of Nancy Heckler, who lives in western Washington. At the time, we were living in this house just 4 months. 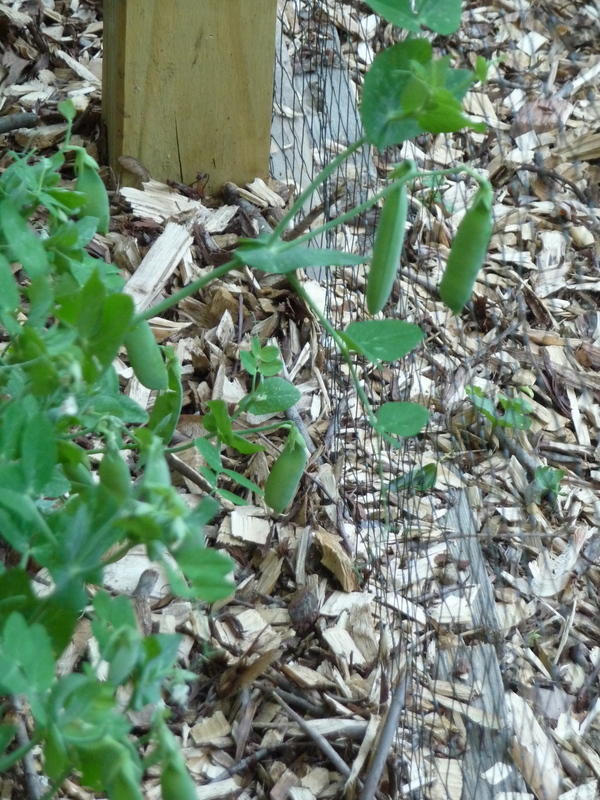 When we moved here, there wasn't a flower to be found on the property, let alone a space for a vegetable garden. But I tore out the article and saved it, for now I had a vision. Heckler's garden combined vegetables and flowers in ways I never thought possible. The article, unfortunately, isn't archived anywhere online so I just have to describe the raised beds filled with stunning combinations: a line of yellow swiss chard backed by clumps of orange and red dahlias. A cedar arbor in the center of the garden covered with scarlet runner beans. Purple kale growing around bright green romanesco cauliflower. Marigolds clumped at the base of tomato plants. Some flower-vegetable combinations had function as well as form: Heckler grows lupines among her broccoli, because broccoli is a heavy eater and depletes the soil of nitrogen, but lupines are of the legume family and their roots actually set nitrogen into the ground. Talk about a match made in heaven. It became my dream to have a vegetable garden that was beautiful to look at and full of whimsical touches. Like any garden, it will always be a work in progress, but I am closer to where I want to be, and I walk through here every day, four or five times a day, and it always brings me joy. Come take a walk with me. I love how you can actually walk through this garden, in one gate and out the other. I found the dragonfly at at Homegoods. There were two in the wall art section and I brought one to the register. As the cashier was ringing me up, I thought aloud, "Maybe I should get the other." The cashier didn't miss a beat, winked at me and said, "Get the other." So I did and that's why there's one on each gate. 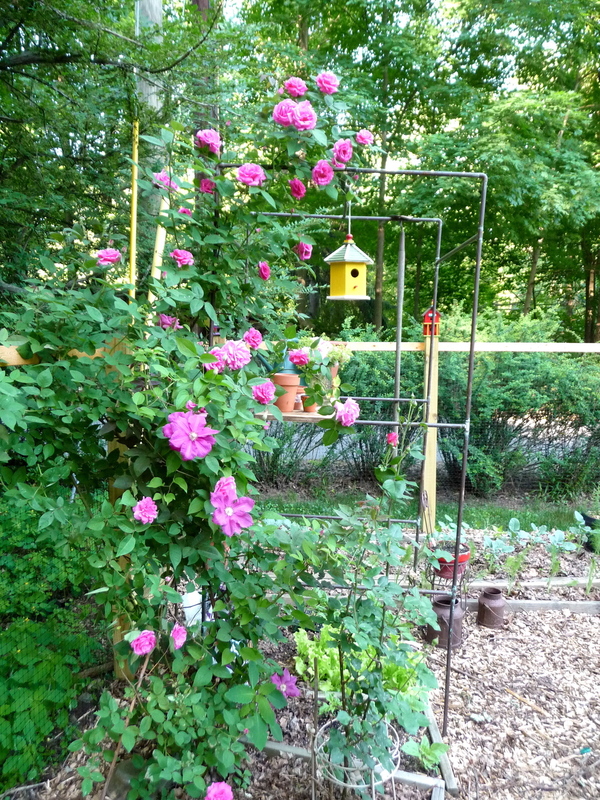 This climbing rose "Zepherine Drouhin" is coming into bloom, and a bright pink clematis grows around it (soybeans are growing in the bed, another nitrogen-fixer). I used to have this gorgeous purple clematis at one of the garden gates but when we re-did the fence this year, I had to move it. And it died. I wasn't expecting this pink one to bloom this year, but maybe it felt bad for me. 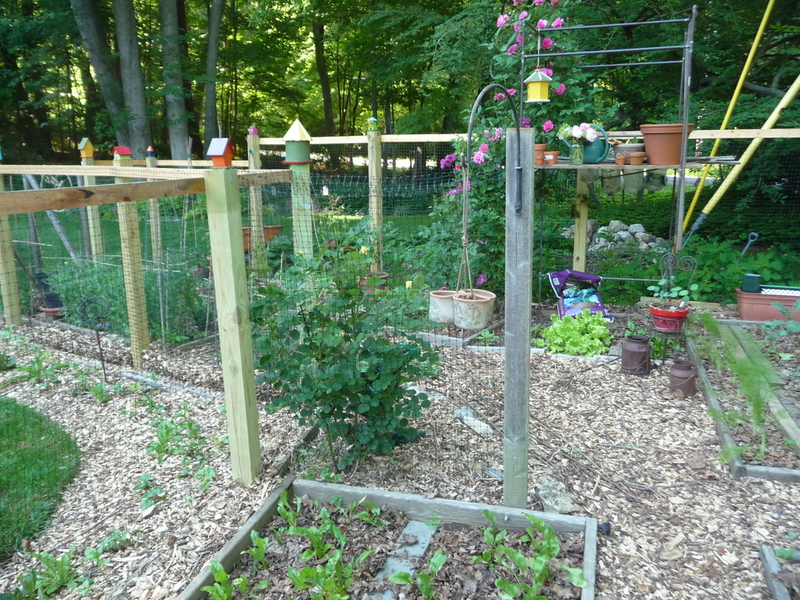 A lot of my roses live inside the vegetable garden otherwise they get mauled by deer, rabbit, woodchucks, and lord knows what else. The Zepherine climbs up this copper structure that Jeeps built when we had the intent of growing our tomatoes upside-down. We snubbed the "Topsy-Turvy" planters hawked on TV and made our own out of gallon-containers of Poland Spring water and some ingenuity. Two seasons I attempted to grow cherry tomatoes this way, with thoroughly mediocre results. Last year I just grew flowers in them and found it to be too high-maintenance with the extra watering needed. So to hell with that, I put a board across the middle poles and turned it into a potting bench. It also makes a shady area underneath to grow lettuce and shelter young seedlings. So the pathways between the beds are finally mulched, courtesy of the swamp maple we had cut down and chipped up couple months ago—there's a 50-Advil weekend. The garden beds all get a shot from the compost pile, and then I mulch the plants with dead leaves. We have woods on 3 sides of the property so there's never any shortage of those. When Jeeps starts bagging the clippings when he mows the lawn, I add those to the beds, too. This is my broccoli bed. Remember it had radishes outlining the plants? Well we ate those, thank you for your kind service. 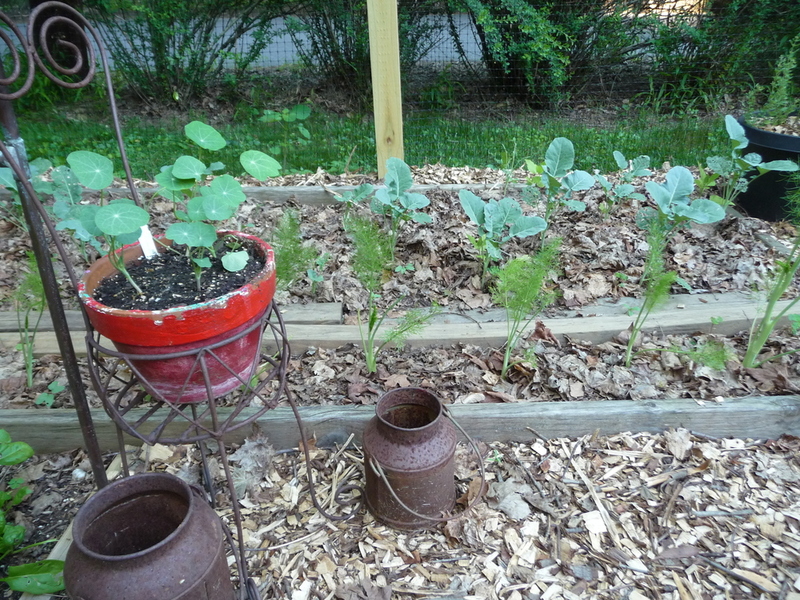 So now the broccoli is mulched with leaves and has another row of fennel fronting it, just WAITING for slaw!!! 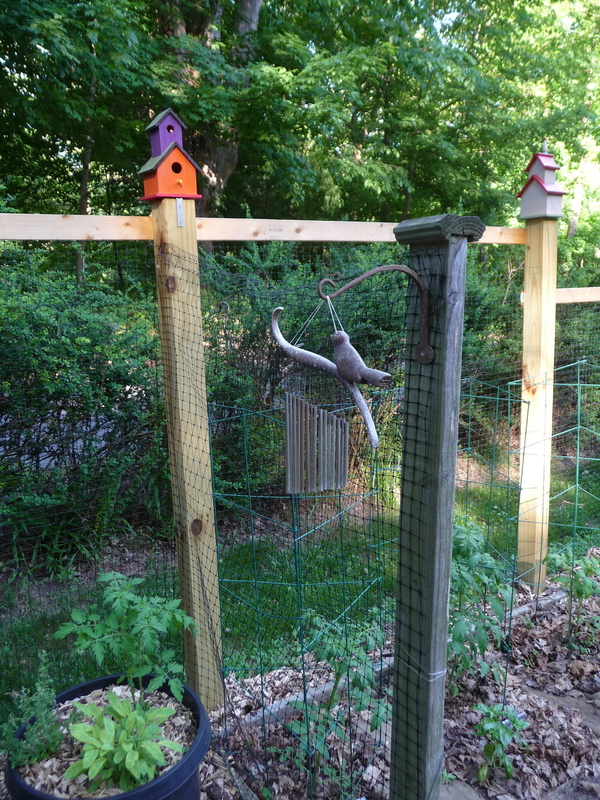 And of course, my birdhouses. When we were re-doing the fence posts, I first thought some kind of decorative filial on the top of each one would look cool. Then in a flash of insight, I thought about birdhouses. Three weekends of painting and three cans of acrylic spray later, I have one on nearly every post. I just love them so much.